What follows is the story of a White House pet, and just possibly its historical effect. The Kennedy White House was notable for the number of animals that eventually occupied it. Among these was President Kennedy’s dog Charlie, a Welsh terrier given to the family by the President’s father, Joseph P. Kennedy. Despite the tendency of the President to react allergically to dogs, Charlie was often with him at the White House and elsewhere. Another dog in the Kennedy menagerie was Pushinka, whom First Lady Jacqueline Kennedy received from Chairman of the Soviet Union Nikita Khrushchev. PX96-33-10. 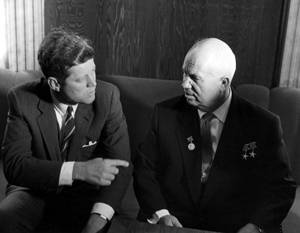 President Kennedy conferring with Premier Khrushchev, 4 June 1961. Pushinka arrived at an inauspicious time for U.S.-Soviet relations. In June 1961, the President and Chairman Khrushchev met in Vienna, Austria. The debacle of the Bay of Pigs had occurred that past spring and the construction of the Berlin Wall was underway. Feelings on both sides were raw and the meetings between Kennedy and Khrushchev were grueling and mostly inconclusive: the Cold War continued. Its most fearsome moment, the Cuban Missile Crisis, was a little more than a year away. Mrs. Kennedy, however, charmed the Chairman, and soon after the Vienna summit, the Soviet Ambassador to the US brought a small, white puppy to the White House as a personal gift from Chairman Khrushchev to the First Lady. President Kennedy was concerned that Pushinka had bugs (of the intelligence-gathering variety) and was not happy that a descendent of a dog in the Soviet Space Program was occupying the White House. But the First Lady often kept state and personal gifts over the President’s objections, and Pushinka was allowed to stay. PX96-33-3. 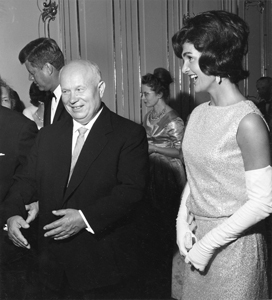 Mrs. Kennedy and Chairman Khrushchev enjoy a laugh at the state dinner, 3 June 1961. There was no tension in the dogs’ relationship, and in 1963 they had four puppies. It is tempting to speculate that during the Cuban Missile Crisis, when the President held the world’s fate in his hands, he thought about these animals, companionable together and blissfully unaware of potential nuclear annihilation. Or perhaps the First Lady, an important confidante to the President and a shrewd judge of psychology, spoke of the human motivations of the Soviets, including Chairman Khrushchev who had given her a dog as a personal gift. JFKWHP-KN-18294. 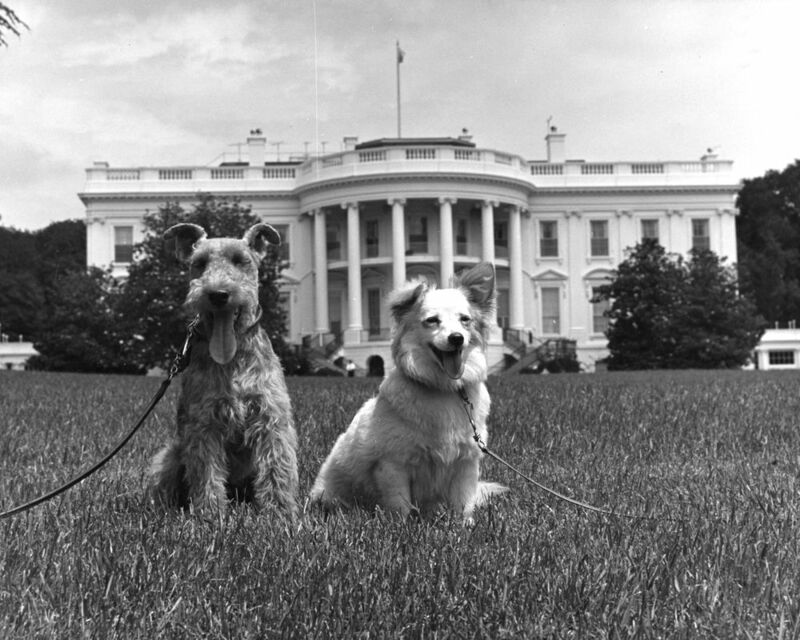 Charlie, left, and Pushinka, right, 22 June 1961. I was wondering if you could give me some information about Charlie, I know Ambassador Kennedy bought Charlie in 1958 for Caroline. But do you have any information on where he purchased Charlie? I am afraid I have not been able to track down further information about the source for Charlie. I have heard a verbal report that Ambassador Kennedy purchased Charlie in a department store, but I have not been able to find any documentary evidence to confirm the purchase or what store it might have been.